As we near National Signing Day, two wide receiver prospects sit near the top of the Florida Gators interest board — Ryan Timmons (Frankfort, Ky.) and James Clark (New Smyrna Beach, Fla.). Both Timmons and Clark were relatively unknown until late in the recruiting process, but the Gators hope that one will become their sixth wide receiver for the 2013 recruiting class. However, which one is the best prospect? Which one would fit better into the Gators offense? And ultimately, which one do the Gators have a better chance with? Both Timmons and Clark are similar wide receivers — they both are burners that will likely play in the slot but can also play on the outside mainly on stretch or “go” routes. Both receivers check in at 5-foot-11, weigh between 175-180 pounds and can afford to put on 10-15 more pounds of muscle. Both players are explosive and run smoothly, with excellent breakaway speed and fluid transition ability. Each prospect has excellent footwork and makes solid lateral movements in open space. Comparatively, Timmons is more of a natural straight route-runner, compared to Clark who is a bit more of a dancer. Each can make a solid slot wide receiver, but Timmons would be the better outside route runner. I would give the upper hand to James Clark in catching ability and speed, though. I think both are great prospects, but based on video analysis, I think Clark is the better prospect, only slightly, however. With Andre Debose graduating after next season (will anyone notice?) and Florida bringing in Alvin Bailey and Chris Thompson for the slot position, the Gators need a speedster. With Thompson being a bit of a project wide receiver, Florida could use Timmons or Clark to really step up into the slot, even as soon as next season. Each player could come in and make a difference in the slot, but based on skill alone, Clark is a bit more polished and that is what the Gators need right now. He comes from a better team, has played tougher competition and proved his abilities on a higher level than Timmons, making Clark a winner only because I believe he can contribute first. The Gators got involved with each prospect late in the process. Both have other options that they are highly considering and neither may have the Gators No. 1. Clark is interested in Ohio State and Clemson, while Timmons is being pursued by Kentucky. However, both prospects will be in town this weekend. The question will come down to two things: University of Florida and then each prospect. The Gators likely are favoring Clark over Timmons because of his ability. However, Joker Phillips, Florida’s wide receivers coach and a former Kentucky head coach, has recruited Timmons very hard over the last two months. 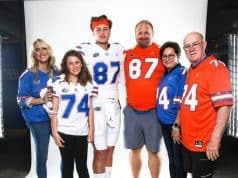 If the Gators had their druthers, I would say they have a better chance of landing Timmons with less of a fight if they show that they really want him on his visit. 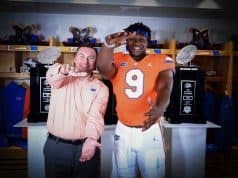 On the other hand, Clark is visiting Florida on his own dime during the last weekend of the recruiting year, which shows he has very high interest in Florida after visiting UF officially only a few weeks ago. I think the Gators will land Clark and pull off a late coup against Clemson and Ohio State. Dan Thompson is a 2010 graduate of the University Florida, graduating with a degree in Economics and a degree in Political Science. During this time at UF, Dan worked three years for the Florida Gator Football team as a recruiting ambassador. Dan dealt daily with prospects, NCAA guidelines, and coaching staff. Dan was also involved in Florida Blue Key, Student Government and Greek Life. Currently, Dan oversees the IT consulting practice of a Tampa-based company. Dan enjoys golfing, country music, bourbon, travel, oysters, and a medium-rare steak. Dan can be found on Twitter at @DK_Thompson.